St. Patrick’s Day is the best thing since Christmas. I particularly love how this holiday has evolved in the US to become this inclusive amalgam of cheerful colors, folklore, and friendship. On March 17th, we’re all Irish! Whether you’ve preemptively taken off work for St. Patrick’s Day or are planning your celebration for the evening, everyone should have a great St. Patty’s. Here are some festive tips for making the most of your holiday at work and after. Sláinte! History: Did you know that boiled bacon is the traditional dish eaten by native Irish on St. Patrick’s Day? Corned beef and cabbage is an Irish-American creation popularized by early Irish immigrants who, starting anew in a foreign place, could afford only the cheapest meats and vegetables. 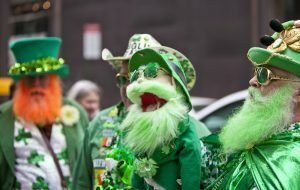 http://www.history.com/topics/st-patricks-dayTech Times published a rather funny article explaining many St. Patrick’s Day traditions and myths that’s worth a read.Teach your organization about St Patrick’s Day by sharing facts and video clips through email. Learn Irish words & phrases: Another way to educate your workforce about Irish culture is to compile and share common or celebratory Irish words and phrases. You can email them out before lunch breaks or share them at morning meetings to get people excited about, and interested in, Irish culture.Many online resources provide pronunciation assistance and our SmartPhones can usually say the words aloud to give you an idea of how they should sound. Smartling published a post on The 50 most Beautiful Words in the Irish Language that provides pronunciations and translations. Play Irish tunes: Traditional Irish songs often tell stories of war, soldiers, pretty girls, and rural life, but the music is usually upbeat and created for dancing. IrishCentral provides a sample of party songs to get your organization in the mood to celebrate, and YouTubers have created great playlists just for St. Patrick’s Day. Gear Up: You can’t go too many places on St. Patty’s without seeing all manner of green and shamrock- or leprechaun-themed accessories such as necklaces, hats, and even socks. Enthusiastic revelers even paint their faces and spray their hair for the celebrations. Give Gifts: What holiday is complete without gift-giving? You don’t have to purchase anything expensive, except maybe a pint for your mate after work, but you can encourage your workforce to participate in both making and giving gifts.You could hold a St. Patty’s Day-themed dessert contest or bake sale and donate proceeds to your local cultural center. You could also set up a paper shamrock creation station in your break room so your employees can create their own festive decorations and gifts. If traditional fare doesn’t appeal, Americanize those classic recipes however you like! Pretty much everything on Bon Appetit’s Irish-inspired recipe list looks absolutely delicious. How you celebrate St. Patrick’s Day on your own time is up to you! Many US cities host parades and pub crawls, and even smaller cities and towns offer green beer and Irish dinner specials at local establishments. If you ever get a chance to travel to the motherland of this holiday, Dublin’s annual St. Patrick’s Festival has previously drawn a million people to Ireland for festivities. Tammy Cohen, an industry pioneer and expert in identity and employment screening, founded InfoMart over 28 years ago. Deemed the “Queen of Screen,” she’s been a force behind industry-leading innovations. She was most recently the first-to-market with a fully compliant sanctions search, as well as a suite of identity services that modernizes talent onboarding. Tammy revolutionized the screening industry when she stepped into the field, developing the first client-facing application and a due diligence criminal search that has since become standard for all background screening companies. Cohen has received national awards and honors for her business and civic involvement, including Atlanta Business Chronicle’s Top 25 Women-Owned Firms in Atlanta, Enterprising Women Magazine’s Enterprising Women of the Year award, the YWCA of Northwest Georgia’s Kathryn Woods Racial Justice Award, and a commendation in the 152nd Congressional Record. To learn more about Tammy, visit www.tammycohen.com. InfoMart has been revolutionizing the global background and identity screening industry for over 28 years, providing businesses the information they need to make informed hiring decisions. They develop innovative technology that modernizes talent onboarding, including a first-to-market biometric identity authentication application and a verified sanctions search. The WBENC-certified company is a founding member of the National Association of Professional Background Screeners, and they have achieved NAPBS accreditation in recognition of their consistent business practices and commitment to compliance with the FCRA. The company is dedicated to customer service, speed, and accuracy, and it has been recognized for its success, workplace culture, and corporate citizenship with over 40 industry awards. To Get the Whole Story on InfoMart, please visit www.infomart-usa.com, follow @InfoMartUSA, or call (770) 984-2727.